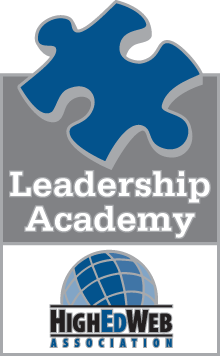 HighEdWeb is pleased to announce that registration for the second HighEdWeb Leadership Academy is now open. Designed to broaden perspectives and advance the leadership abilities of Web professionals working in higher education, this intense program offers interactive learning experiences in a small group setting. Saturday Oct. 5, 2013, 1-4:30 p.m. and 6-8:30 p.m.
Sunday, Oct. 6, 2013, 8 a.m.-4:30 p.m.
Academy registration is handled separately from conference registration. The cost is $400 and includes dinner on Saturday, Oct. 5, and breakfast and lunch on Sunday, Oct. 6. Space is limited to 32. What do past attendees have to say about the academy?